Post Berlin I was in a haze. Everything was a massive blur from the chaotic wonderment that encapsulated me there. I suppose I was a bit heartbroken about the matter, and this was because throughout my life I’ve always connected when I’ve been disconnected from wherever I called my home. A friend I had met in Berlin decided to visit me nearly three weeks later from my departure from his city. I decided to return the favor in showing him the sights of my home in Los Angeles since he had been so gracious to do the same in Berlin. In my time with him, we traveled around Los Angeles. Steadfast in my project with TENxTENxTEN I carried a blank Mickey around with me to figure out what feeling or chapter I was going to paint about in our adventures. His main focus in all of this was a vacation of sorts for both him and I, and I was to relax. Of course, I made whatever this focus was for him, to further my aesthetic into my project. We decided to leave my home in Los Feliz, and we rented a house on the boardwalk of Venice Beach. While there, he walked the boardwalk in the daytime, and I sat in the front patio of the house painting around Mickey’s silhouette, minutely struggling to come up with a concept of our adventures.. and this came to mind. I decided to focus on BLISS, that ever incredible feeling of just being in felicity of one’s surroundings. We traveled from Venice Beach to Palm Springs a day later, and I spent the remainder of this piece painting in the quiet breeze of the desert. This painting represents the calm from the wild storms of heartache and anxiety. 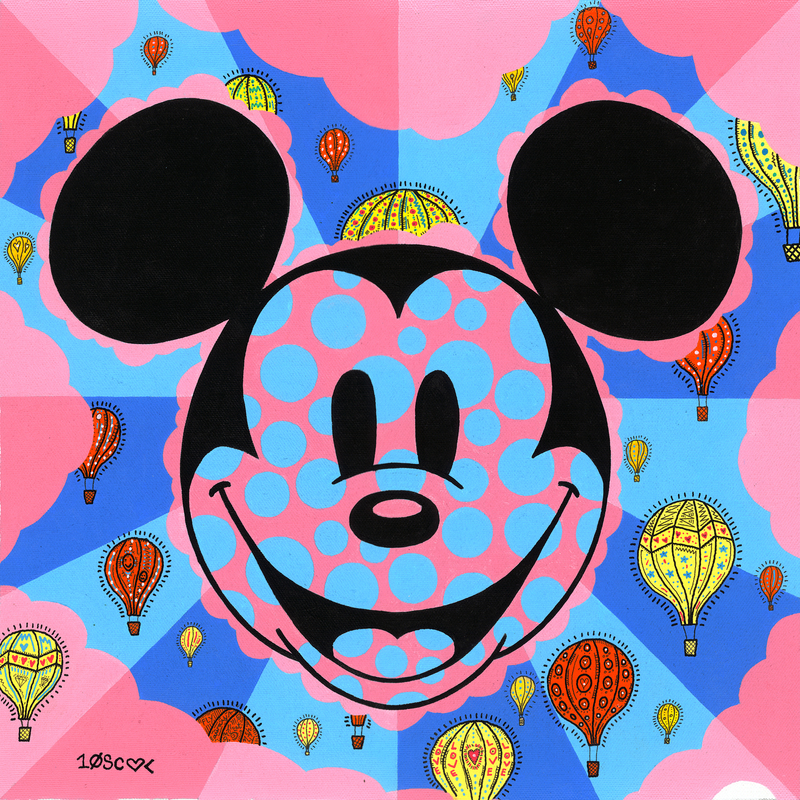 In here, Mickey is floating among tranquil bubbles and soft arching hot air balloons that quietly smooth around the circumference of a cotton candy universe. This piece speaks of that vacationing quiet that soothes the troubled heart and calms the quelling mind of life’s trials and tribulations. This is the 79th in TENxTENxTEN collection, and number 9 in “The Human Condition Series.